If you haven’t protected your plants from animal damage yet, you still have time. Winter in northern climates is part of the natural process for plants. And so is the presence of deer, rabbits and mice that survive our winters by eating dormant plants. 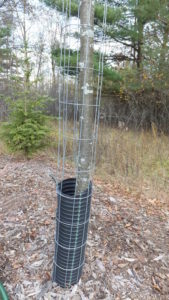 Here a tree stem is protected from deer, rabbits and mice. Protecting valuable landscape plants from permanent damage is easy to do, but the devil is in the details. Deer, rabbits and mice/voles damage plants in different ways and you have to protect against all three. Deer will tear off branches to eat and during the fall and early winter bucks will also rub their antlers on stems of trees, removing the bark. Rabbits cut away at branches and stems as high as they can reach and snow may help them reach higher. Mice and voles gnaw at the base of plants, girdle trees and even burrow down into the root system. Mice can operate unseen in the slim layer between the ground and snow cover, only revealing damage during the spring thaw. Some plant varieties are less subject to damage, but under the right conditions any plant can be damaged. Fruit trees and fruit shrubs are often more damaged than other plants because they apparently taste good to animals. To protect against deer, plants need to be fenced to above where deer can reach. That can be 5 feet or more. Rabbit protection also needs to extend up to the height they can reach. Since mice mainly operate very close to the ground, collars around the base of the plant that fit tight to the ground are needed. It is easiest to incorporate protection against deer, rabbits and mice at the same time. Protect your plants now and enjoy them in the spring!